An enjoyment of farming, tax laws, and a devotion to the history of cigars are the unique combination that led Jeff Borysiewicz to launch his Florida Sun Grown tobacco endeavor. Up until last year, no long-filler cigar tobacco had been grown in Florida since 1977. Borysiewicz is owner of the Orlando-area Corona Cigar stores and a partner in the Sindicato cigar company. He also is one of the most dedicated advocates for cigar freedom through his roles as co-founder and board chairman of Cigar Rights of America and the founder of the Puro PAC, a political action committee that supports cigar rights and pro-cigar candidates. Now he can add tobacco farmer to the list. “I’ve always had a passion for farming,” he told me when we discussed his new project, noting that he was even a state tractor driving champion in his youth. More recently, Borysiewicz purchased land in Clermont (45 miles from Orlando). Soon after, his tax attorney informed him that unless he grew something on the land, he’d have to pay residential tax rates on the land. So the idea for combining his enjoyment of farming and tobacco came into focus. In 2013, a test crop of 10,000 plants was cultivated, half Corojo seed and half Criollo. The test proved successful enough that this year 45,000 seedlings were being planted, all of the Corojo variety, and new curing barns were built. The goal is eventually to produce sun-grown leaf that can be used as wrapper that will take on its own unique flavor profile. 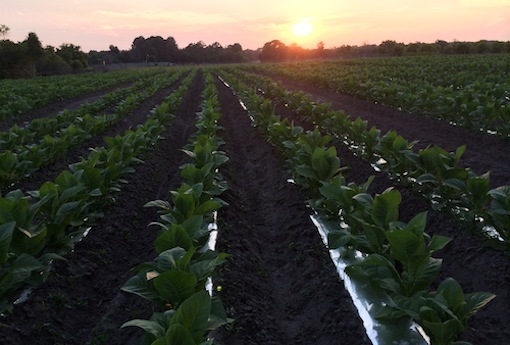 While it’s a unique project, growing cigar tobacco in Florida isn’t unprecedented. 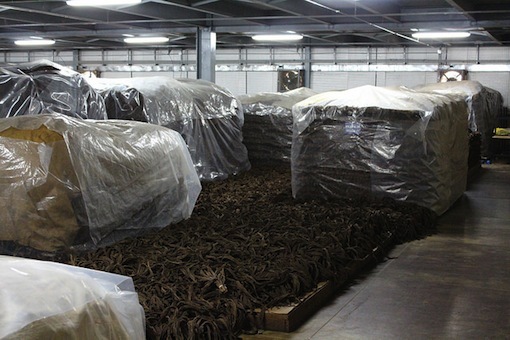 A considerable amount of cigar tobacco used to be grown in Florida, second only to Connecticut within the U.S., especially in the panhandle region around Quincy. After the Cuban embargo, such legendary tobacco men as Angel Oliva grew there, at the same time as they planted their first crops in Central America. Eventually, the cost of labor in Florida, and a move towards homogenized wrappers for the Tampa-based factories that had been their main customers, caused production of Florida tobacco to cease in the late 1970s. I got to examine the tobacco while visiting Drew Estate in Nicaragua last month. 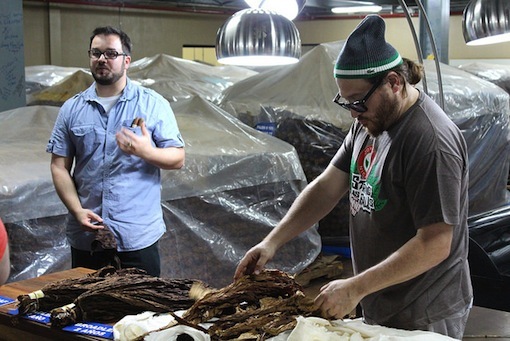 While that tobacco isn’t quite ready to be made into cigars, Jonathan Drew and Nick Mellilo of Drew Estate say the results look promising. I can personally attest to its strong, unique aroma. That first crop yielded roughly 45,000 filer leaves, which, as of last month, was still fermenting in Drew Estate’s DE2 pre-industry facility. The leaf is on the small size, but it could be used as a filler component in a blend (either for 45,000 cigars using one leaf each, or 90,000 cigars with a half leaf in each). That crop was allowed to grow mostly wild (without priming), which produced only filler. But the hope is that wrapper-quality leaf will soon follow. Borysiewiz has been friends with Jonathan Drew since they both were getting into the cigar industry in the 1990s, so it was a natural pairing, especially now that Drew Estate has the capacity with its new facility. What project exactly the “Florida Sun Grown” (a name Jeff Borysiewicz has trademarked) will be part of is yet to be seen. But even with the larger crop this year it will always be a limited, unique product. In the meantime, the project gives Borysiewicz another talking point when telling politicians about the need to protect cigars from federal bureaucrats. Florida Sun Grown tobacco is another example of American jobs being created by the premium cigar industry. If the FDA makes projects like this not financially viable, however, those jobs will no longer exist. I assume any cigar with a FSG leaf would have to be expensive given the higher labor costs in Florida relative to Nicaragua, Honduras, etc. Any insight on the unique flavor profile the leaf might offer to justify such a cost? I'm less excited about paying a premium for a cigar for no other reason than to help Jeff, as much as I like him, avoid residential tax. Time will tell, but the idea is that the FSG tobacco has unique characteristics not found in Corojo grown elsewhere. The hope is (and according to the guys at Drew Estate the early indications are) that the FSG leaf is different from corojo grown elsewhere and that's why it would be worth paying a slight premium for, but honestly it's too early to know right now since the first crop isn't fully fermented and aged yet, and the second crop is still in the field. Thanks, Patrick. Please keep us apprised as it becomes clearer how the FSG tobacco will be used.